Dear users, contributors, fans and friends. We are proud to present to you the latest openSUSE release! It is the result of 10 months of hard work by the openSUSE community and allows you to enjoy the latest that Free Software has to offer, with the unique openSUSE touch — stable, friendly, fun. The following pages go into more detail on what is new in this openSUSE release. Too much information? Check out the Feature highlights instead. Although the most obvious improvements to openSUSE 12.2 may be on the surface, we have made a slew of improvements under the hood as well to improve booting, hardware management and system configuration. Furthermore, most basic libraries and systemwide tools for security, language support and documentation have seen significant work. openSUSE of course worked on the plumbing that gets you to your applications: the boot loader, kernel, init system and more. 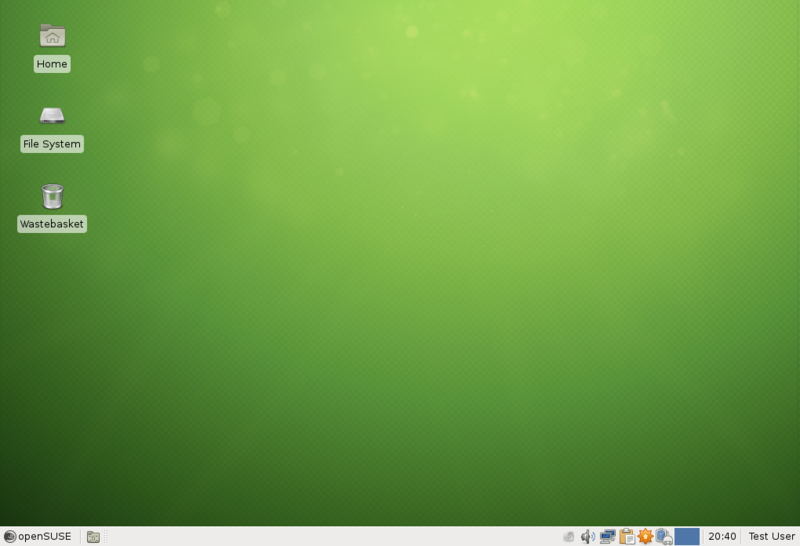 openSUSE 12.2 builds upon Linux kernel 3.4. This release includes several Btrfs updates: support of metadata blocks bigger than 4KB, much improved metadata performance, better error handling and better recovery tools; there is also a new X32 ABI which allows to run programs in 64-bit mode with 32-bit pointers; several updates to the GPU drivers: early modesetting of Nvidia GeForce 600 'Kepler', support of AMD Radeon 7xxx and AMD Trinity APU series, and support of Intel Medfield graphics; there is also support of x86 CPU driver autoprobing, a device-mapper target that stores cryptographic hashes of blocks to check for intrusions, another target to use external read-only devices as origin source of a thin provisioned LVM volume, several perf improvements such as GTK2 report GUI and a new 'Yama' security module. There are also many small features and new drivers and fixes are also available. This description comes from Kernelnewbies.org where you can read more details. Systemd 44 adds watchdog support for supervising services. The new top-like process management tool (systemd-cgtop) shows resource usage of services per control-group rather than per process to make it easier to see which service uses memory, CPU etc. Systemd also improved readahead for even faster boot. Introduction of the "journal" allows among other things fast per-service logging. openSUSE moves to GRUB2 as its default boot loader. GRUB2 is now mature, and is supported, unlike its predecessor. The released version is bumped to 2.00final. GRUB2 allows us to support new technologies such as UEFI cleanly, it could also chainloader other efi loader or loading efi stub kernel. It can boot from LVM and btrfs partitions, as well as encrypted partitions. Its menus can be translated, and themed. GRUB Legacy is still available. plymouth is now used for the boot splash screen. It allows for flicker-free boot on systems with kernel mode switching (KMS) support. Passphrase prompts for encrypted disks are also handled by plymouth. glibc 2.15 optimizes performance of many functions, especially on 64bit systems. Support for the syscalls process_vm_writev and process_vm_readv allow fast data transfer between processes in user space. The new program 'pldd' (package glibc-utils) allows to list loaded shared libraries of running processes. Combined with compiling all of openSUSE with GCC 4.7.1, you'll notice significant improvements in run-time performance of a number of tools including the zypper package manager. BIND 9.9 improves DNSSEC support by e.g. adding support for inline signing of zones which greatly simplifies the deployment of DNSSEC. On multi-core machines multi-threading now improves the query performance. The startup speed of BIND has been improved as well to reduce the downtime between restarts. OpenSSH 6.0 enhances privilege separation and sandboxing in addition to many bug fixes. It also adds SHA256 based HMAC transport integrity modes. openssl 1.0.1c brings support for TLS version 1.1 and 1.2 support, Next Protocol Negotiation and the Secure Remote Password (SRP) Protocol. The ecryptfs-utils are functional now out of the box and have better PAM integration. The X server now reports multi-touch events on hardware that supports it, like man tablets and laptops. And enabled udev/systemd-based multi-seat support. The Mesa 3D library version 8.0 introduces OpenGL 3.0 support. To keep the library clean many outdated and unmaintained drivers have been removed, such as those that do not support DRI2. Mesa includes the llvmpipe driver enabling 3D support on VMWare virtual machines and physical machines without 3D hardware. SPICE is included in openSUSE for the first time. SPICE is a system to display a remote or virtualized system's applications and devices. UsrMerge In openSUSE 12.2 the UsrMerge initiative started to move binaries and libraries from subdirectories of / (such as /bin) to subdirectories /usr. Symlinks in the old location provide backward compatibility. This effort continues for the next release. wine 1.5.6 now has way better C# / .NET 4 integration and support by automatically downloading a Mono C# build on demand and got Lots of DirectX, OpenGL and DirectSound improvements for Games. libgphoto2 2.4.14 has gained support for Samsung Galaxy devices, the Canon EOS camera directory access made faster and there are lots of improvements to remote capture support. openSUSE is unique among the major Linux distributions in delivering all major Free Desktops on equal foot: officially developed and supported. 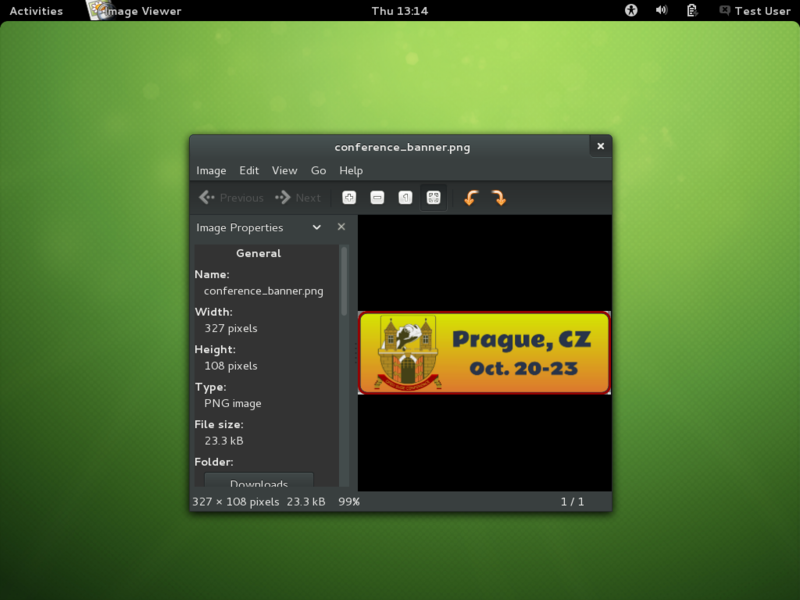 These include GNOME, KDE’s Plasma Desktop (the default desktop) and Plasma Netbook, Xfce, and LXDE. Version 4.8.4 of KDE Plasma Workspaces, Applications and Platform are included, marking a big leap since 4.7.2 on openSUSE 12.1. Plasma Workspace include performance improvements to the window manager, enhanced power management utilities, a redesigned window switcher popup and several other applets. The file manager, Dolphin, has faster and more polished view code, while the picture viewer has improved image zoom and slideshow effects. KMail has seen many performance and bug fixes, including the resolution of a long-standing problem with client-side mail filtering. Marble, the mapping and globe app, can display the elevation profile of a route to better plan an outdoor trip, and in planet mode can display satellites' orbits. Developers will enjoy improvements to the text editor's search and replace functions, vi mode, and a faster translation tool with support for more file formats. 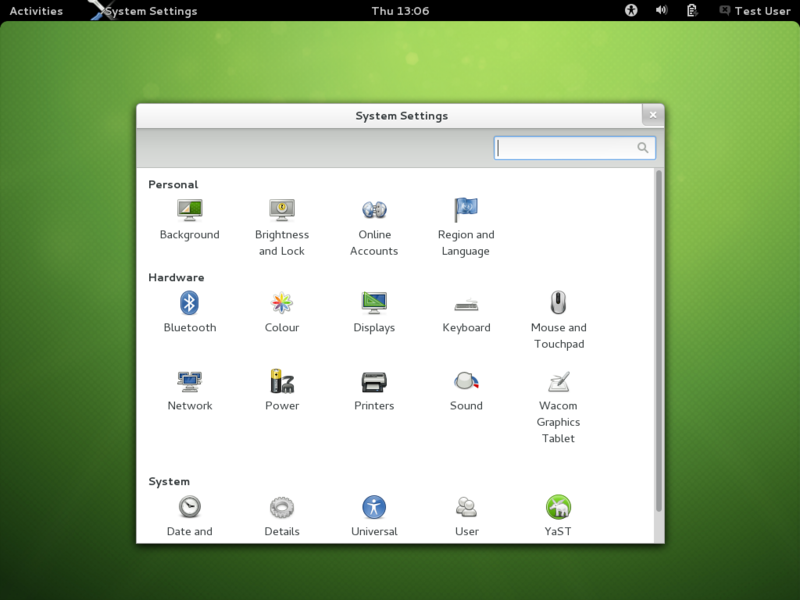 This is the second openSUSE release featuring GNOME 3, which continues to evolve rapidly. GNOME 3.4 introduces 'Web', a repackaging of Epiphany, the lightweight GNOME web browser with a redesigned user interface. Support for video calling comes to the Empathy messenger, and support for Facebook and Windows Live has been added to Online Accounts. 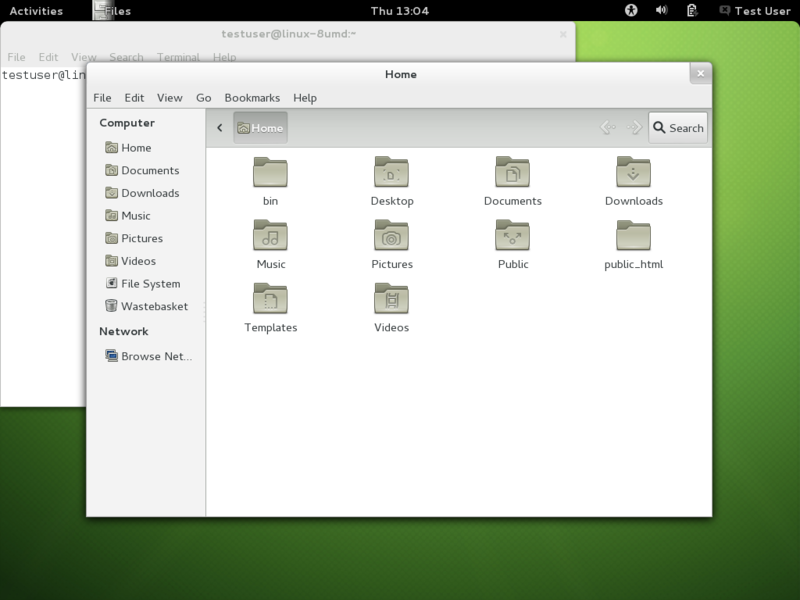 Gnome Shell now shows application menus from the main title bar, and includes integrated document search functions from the overview. The Contacts and Documents applications have been polished, as have many pages of the System Settings app. All applications will benefit from improvements to GTK3, such as smooth scrolling of window contents and redesigned, unobtrusive scroll bars. The inclusion of the llvmpipe software 3D renderer allows gnome-shell to run on systems without 3D hardware, including virtual machines. Wireless network connections can now be added by non-root users, and notebook users will enjoy the sensible defaults of enabling tap-to-click and disabling the touchpad while typing. Many apps' documentation have been improved as well. 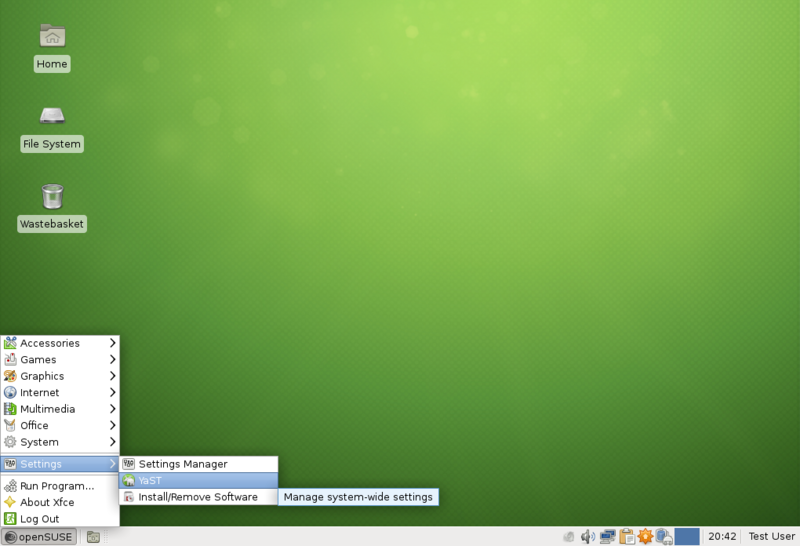 Xfce has been updated to the latest major release 4.10. 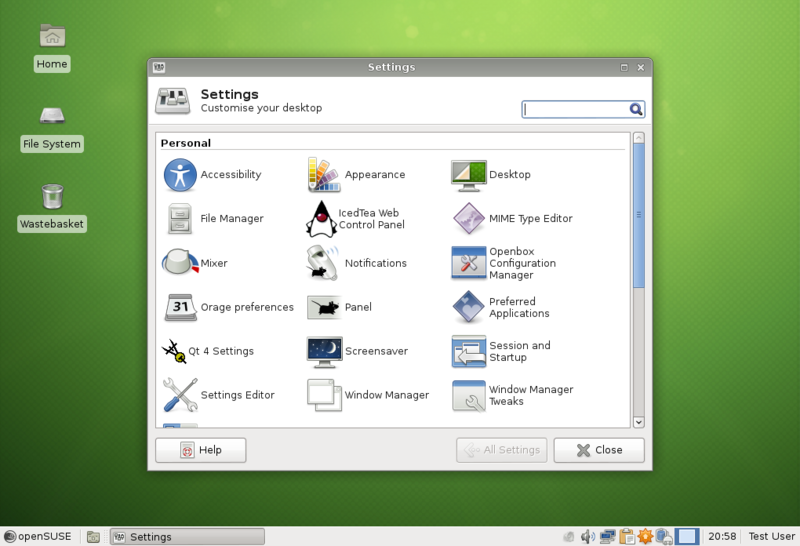 Xfce 4.10 does not bring radical changes to the user interface and applications but rather provides numerous improvements to the user experience as well as the implementation of several long-standing feature requests. The xfwm4 window manager has gained optional support for basic tiling when moving windows to the desktop edges. The window switcher is now themable and allows navigation via cursor keys. The application finder has been rewritten, its user interface has been improved, it now supports user-defined actions based on matching a prefix or a regex pattern and it now replaces the "Run Program" dialog. The panel can now be configured to align plugins in multiple rows and features a new deskbar mode in which the panel is aligned vertically whereas plugins are laid out horizontally. Panels in deskbar mode using multiple rows can be useful for wide screens since they allow the use of wide panels on the side that make use of abundant horizontal space while perserving precious horizontal space. A new editor for MIME type associations has been added that easily allows changing the applications which are used to open a certain file type. The desktop manager can now render thumbnails, supports automatic cycling through a list of wallpapers and can be configured to operate in a single-click mode. The settings manager has been revamped, configuration dialogs are now organized in categories, entries can be searched for names and descriptions of settings, and most settings dialogs are now embedded in the settings manager window. The application autostart functionality has been changed, GNOME compatibility mode now only starts gnome-keyring and not all GNOME-specific autostart applications any more. GNOME- and KDE-only autostart applications can now be enabled manually through the "Session and Startup" settings dialog. Toolkit and Icon themes can now be more easily installed by dragging them onto the style or icon list of the "Appearance" settings dialog. Furthermore, the openSUSE Xfce default branding has been polished, the icon theme has been improved for greater visual consistency, and compositing support and gnome-keyring integration are now enabled by default to provide a better user experience out of the box. For a visual tour of the changes in Xfce 4.10 see http://xfce.org/about/tour. 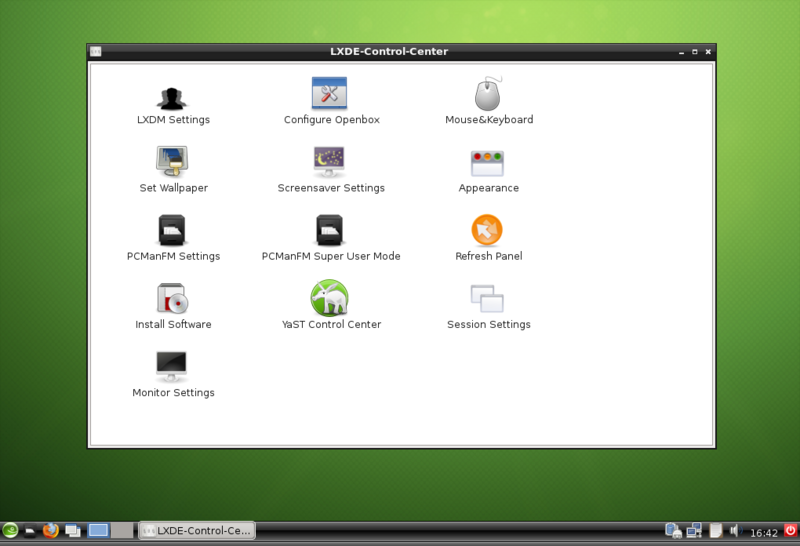 LXDE sees an updated panel, with new applets, as well as bugfixes and theming improvements across the desktop. KDE 3 has got a new Udisks2 mediamanager backend which provides full support for Udisks2 subsystem which replaced HAL. Earlier KDE 3 also acquired support for Upower. All the desktops will benefit from the inclusion of the new free screen font by Adobe, Source Sans. International users, especially those in CJK countries, will enjoy the improved m17n stack. 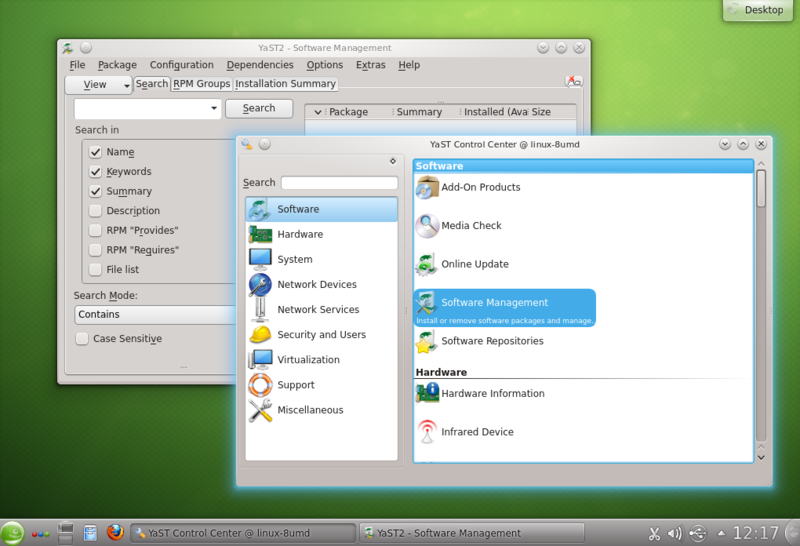 On top of the kernel and other low-level tools, openSUSE provides a huge variety of console and graphical applications. These applications have been updated to the latest versions bringing many improvements in terms of features and bugfixes. Chromium is the modern and innovative web browser based on Google Chrome, integrating very well with Google's services. The latest Chromium brings the usual slew of performance improvements and has NativeClient support enabled for openSUSE 12.2. Firefox is the number one browser among openSUSE users. Developed by Mozilla, 12.2 includes the 14.0.1 version (but 15 will already be brought in on the first on-line update) bringing much improved memory handling and better performance as well as support for the latest web standards including the new SPDY protocol to speed up the loading of complex web pages. Import of Google Chromium data has been improved and a speed dial is now present on the new tab page. This version also brings Firefox Sync to openSUSE, allowing users to synchronize their bookmarks, history, passwords, add-ons and open tabs with another copy of Firefox. Rekonq is a lightweight WebKit-based browser built on KDE. openSUSE 12.2 includes rekonq 0.9.2, introducing a new tab page, providing password, bookmark, and history sync features as well as improved URL and bookmarks toolbars, and bringing much improved stability and performance and new WebKit settings. Gimp 2.80, the image editor, comes with several new improvements in different areas, like the user interface, where the "single-window mode" to open several images in tabs, will be noticed really quick by openSUSE users. Krita is a painting application for digital artists. openSUSE 12.2 delivers version 2.4 including a new smudging option, a composition docker, and selection capabilities of predefined size/dpi combinations amongst many other new features. Scribus is a Free Software desktop publishing program. openSUSE 12.2 comes with an updated version (1.4.1) that improves performance and fix several bugs. Translations have been also improved. Inkscape is a Free Software scalable vector graphics editor. 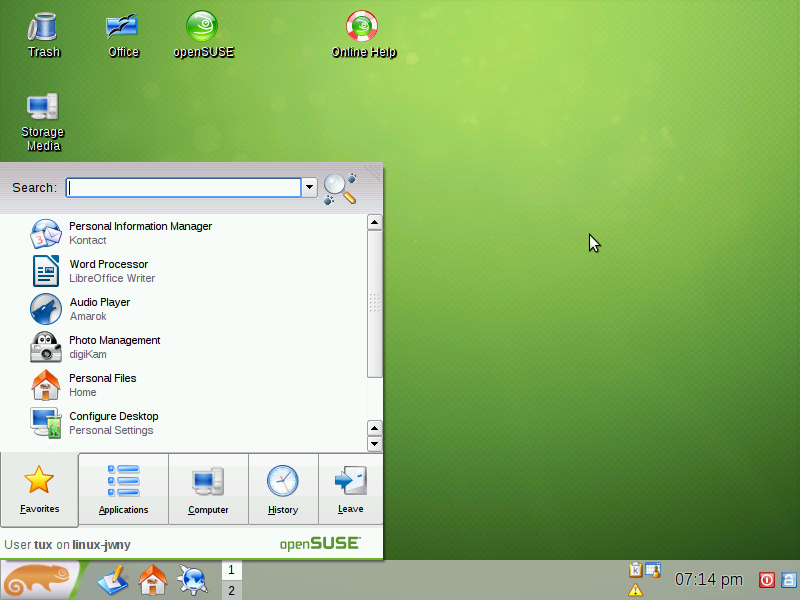 openSUSE 12.2 includes 0.48.3.1 version, that comes with stability and bug fixes. Tomahawk is a last generation multi-platform music player. openSUSE 12.2 release includes its 0.4.2 version that comes with heavy improvements in CPU usage and lots of bugs fixed. Amarok is a well known Free Software music player. openSUSE 12.2 brings 2.5 version with a rewrite of the Automated Playlist Generator algorithm, improvements in CPU usage and better detection of mounts of NFS & SMB Shares, among many other improvements. Darktable 1.0.5 is a photography application and RAW tool that is new in openSUSE 12.2, a virtual lighttable and darkroom for photographers. Rapid Photo Downloader 0.4.4 is a photography tool for bulk photo transfers. 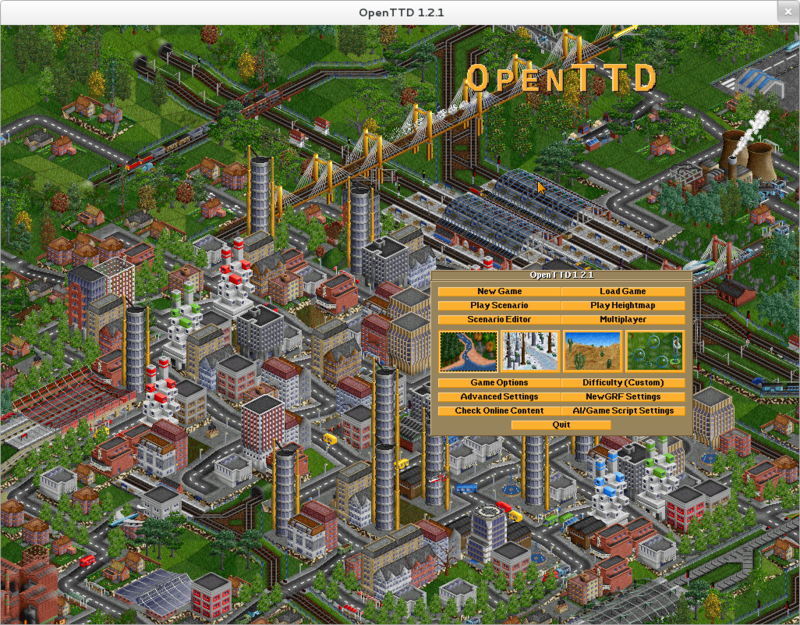 openTTD is an open source transport simulation game, resembling "Transport Tycoon Deluxe". Look and feel is similar to the original but gameplay was improved significantly. openTTD also features a multi-player mode for up to 255 players. Pragha is a lightweight music player for Xfce desktop, based on GTK+, SQLite, completely written in C, constructed to be fast, light, and simultaneously complete without obstructing your daily work. 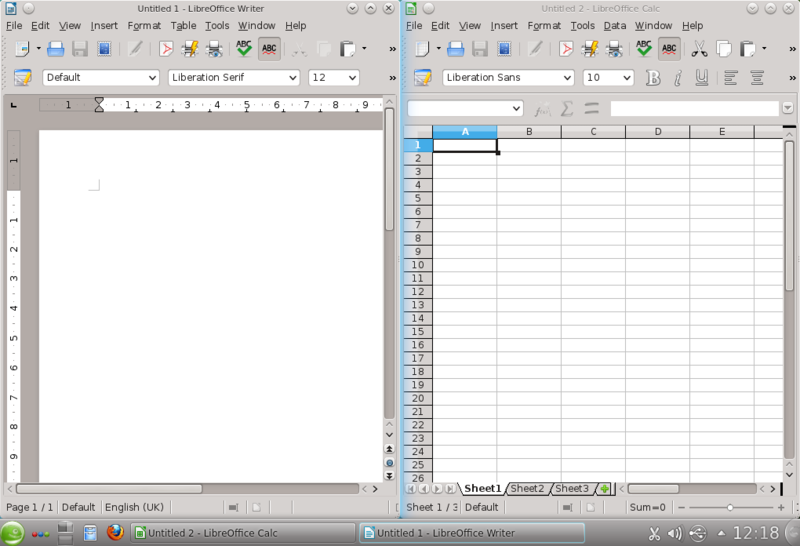 Calligra is a Free Software multiplatform office suite that includes several components. openSUSE 12.2 includes 2.4.2 version that include many bugfixes in every component. Gnumeric is the oldest graphical Free Software spreedsheet. Part of the GNOME project, in this version, 1.11.3 comes with many bug fixes. Evolution 3.4.4 is a stable and versatile personal information manager for the GNOME project. Evolution allows you to keep your calendar, email, address book and tasks in one place. Evolution has the ability to filter Junk/Spam Mail, add your favorite web calenders, and to keep your information safe and secure. In addition to native POP3, IMAP and GroupWise support, the Evolution project has connector options for Exchange 2003-2010. 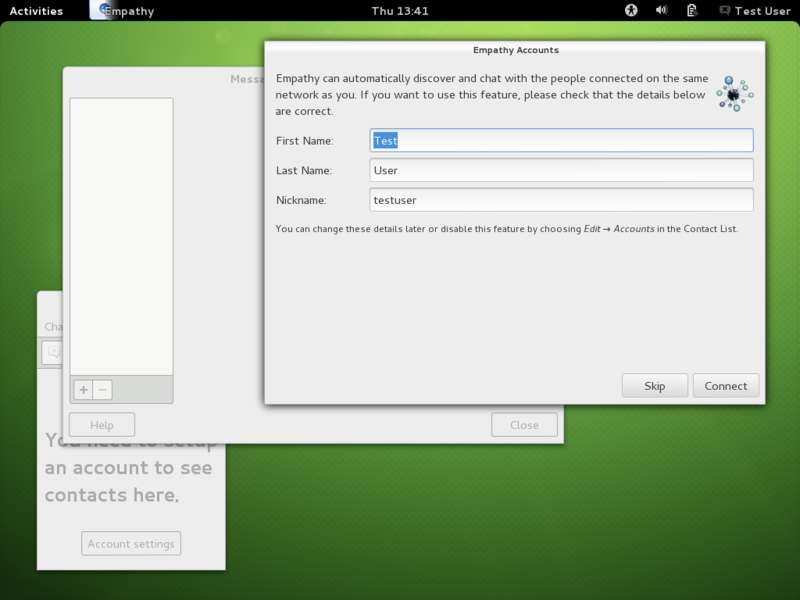 Kontact is a personal information management suite for KDE. openSUSE 12.2 ships Kontact 4.8.4 which brings many stability and performance improvements including the fixing of the dreaded filter issues. 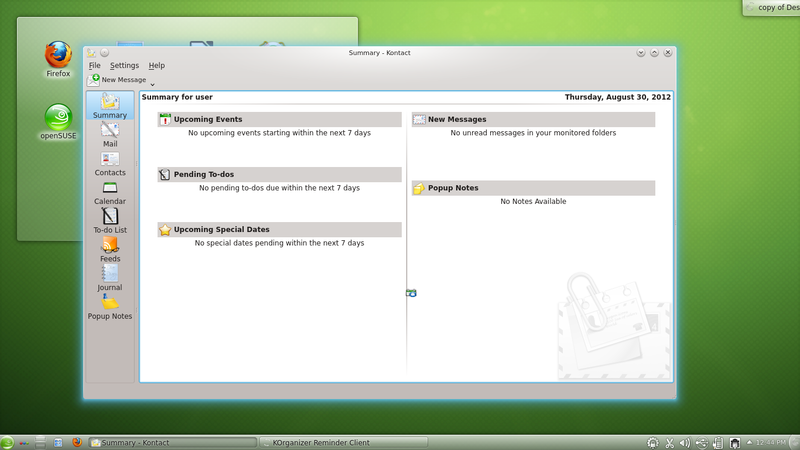 Thunderbird is a multiplatform Free Software email/news/RSS application, developed by Mozilla. openSUSE ships 14.0 version of the program that allow users to sign up for a personalized email address from within the application (in partnership with Gandi and Hover), among other services. It comes with several improvements in the user interface and security/general fixes Thunderbird is based on the new Mozilla Gecko engine. Stellarium is an astronomical simulator that renders 3D photos in real time. 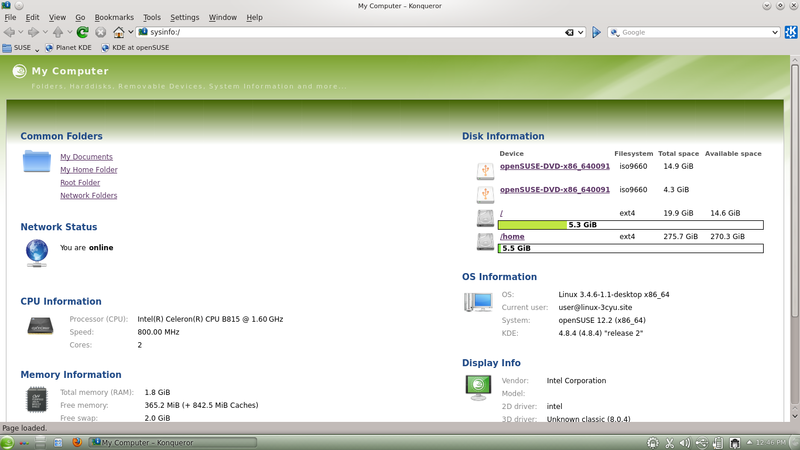 openSUSE 12.2 ships version 0.11.3. Octave, the interpreted language for numeric computations is for the first time available in openSUSE, version 3.6.2. Maxima is a symbolic computation program doing symbolic manipulation of polynomials, matrices, rational functions, integration, Todd-Coxeter methods for finite groups analysis, graphing, bigfloats. openSUSE 12.2 ships this application for the first time (version 5.27). [wxmaxima] is the graphical user interface for Maxima. vtk, The Visualization ToolKit, is a Free Software, freely available software system for 3D computer graphics, image processing and visualization. It is a new package in openSUSE 12.2 repository (version 5.10). Mathgl is a cross-platform library for making high-quality scientific graphics. openSUSE 12.2 ships 2.0.2 version. Veusz is a GUI scientific plotting and graphing package. This is a new package.Version 1.16 is included in openSUSE 12.2 as a new package. 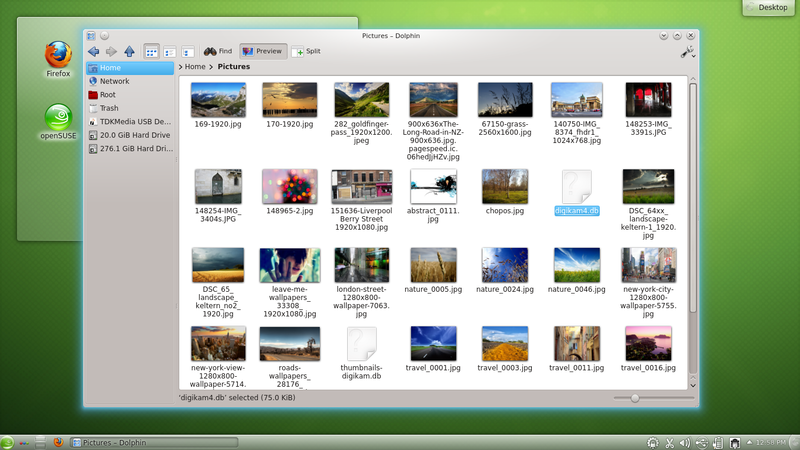 Dolphin 4.8.4 is KDE's file manager. Several bugs have been fixed in this version, highly integrated with Nepomuk. The user interface is now faster and smoother, animations have been improved and grouping capabilities have been added, among other features. Nautilus is GNOME's file manager. This release includes 3.4.2 version that comes with several new features like a polished UI or introduce Undo support for common file operations. GNUCash, the personal and small-business financial-accounting software, comes with several bugfixes in 2.4.10 version. KMyMoney is a personal and small business accounting multiplatform application. openSUSE 12.2 comes with version 4.6.2 including many features like OFX support, GnuCash file import and QIF import on Windows. 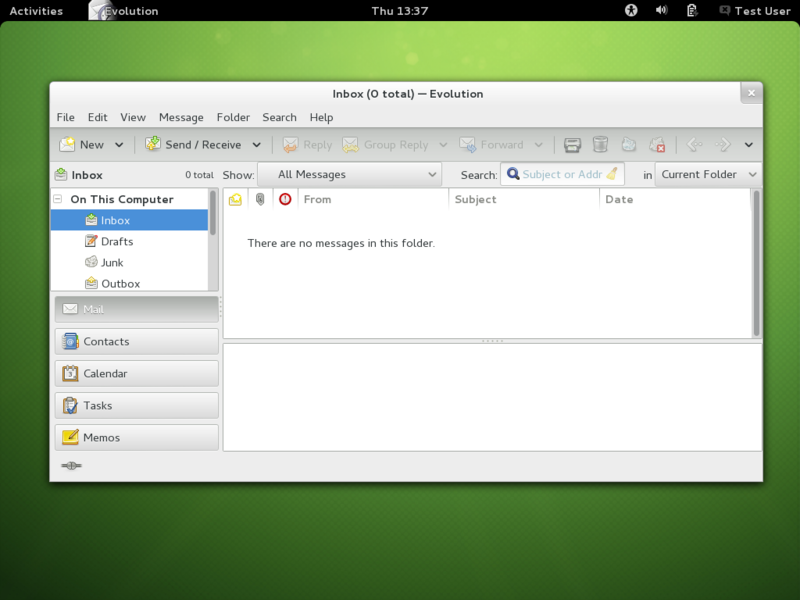 openSUSE 12.2 includes a module-based multiprotocol instant messenger build on Qt, qutIM. It supports various protocols, such as ICQ, Jabber, IRC, Mail.ru Agent and VKontakte. openSUSE 12.2 ships 0.3.1 version. NCurses Disk Usage aka. ncdu, ncurses version of 'du' which provides a fast way to see what directories are using your disk space. openSUSE 12.2 comes with many updated and new development tools and libraries as well as everything you need to maintain and deploy servers, desktop systems and Virtual Machines. The powerful and unique YaST tool is crucial in these last tasks and continues to be a great tool for openSUSE users world wide. openSUSE 12.2 moved over to the 4.7 branch of GCC, the GNU Compiler Collection. All of openSUSE has been compiled with GCC 4.7.1, bringing better performance as well as support for a significant subset of the ISO C++11 and C11 standards and improvements in many other language components including supporting version 3.1 of the OpenMP specification for C, C++ and Fortran. Qt Creator 2.5 includes greatly improved C++11 support, a clipboard history, and a TODO plugin. With Qt 4.8.1 we introduce QPA(Qt Platform Abstraction). This makes it easy to port Qt to different windowing systems and devices. It enables those of us that are not OpenGL-ninjas to render OpenGL from more than one thread concurrently. It makes multithreaded HTTP easy and has an optimized file system access. openSUSE 12.2 ships OpenJDK 7 (java-1_7_0-openjdk). As upstream support for OpenJDK 6 (java-1_6_0-openjdk) ends in November it's no longer included. gnu-efi, the library to develop EFI applications for IA-64 (IPF), IA-32 (x86) , and x86_64 platforms using the GNU toolchain and the EFI development environment. 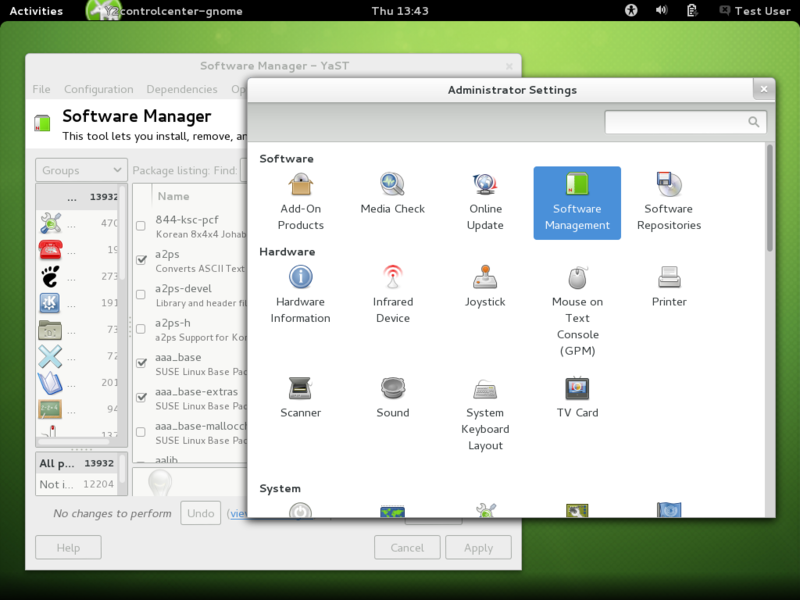 openSUSE 12.2 includes version 3.0q, the newest upstream releases version, it brings many more improvements. Perl 5.16.0 supports most of unicode 6.1 so you can even use unicode characters in symbol names now. openSUSE 12.2 includes the stable version 1.0.2 of Google's concurrent programming language Go. It is type and memory-safe, has an efficient, latency-free garbage collection and it has an ultra fast compiler. QEMU 1.1.0 brings more supports, such as KVM in-kernel IRQ chip, virtio-scsi, USB 3.0, and PCI-to-PCI bridges. In addition, inspection/modification of new QEMU Object Model (QOM) through QEMU Monitor Protocol, provides many other new QMP commands, a guest agent(qemu-ga), and a bridge helper utility. Tomcat 7 has been added to openSUSE, it implements the Servlet 3.0 and JavaServer Pages 2.2 and many more. In addition, we dropped Tomcat 6 and the jpackage.org naming scheme. Firebird 2.5 including new SuperClient model and reworked threading architecture. Embedded server is now based on SuperClient, allowing simultaneous access to a database from multiple applications. openSUSE is the center of an ecosystem of companies and individuals who provide services or additional functionality to openSUSE. Examples include of course SUSE Linux GmbH but also the third-party repository Packman team and openSUSE projects like the Open Build Service. A few changes are relevant for openSUSE 12.2 users. The update repos were split to have separate oss and non-oss repositories. Please refer to the bug report for details. SUSE Studio users can expect availability of openSUSE 12.2 right from the release date, and support for upgrading existing appliances shortly after. This means it will be possible to easily create your own versions of openSUSE 12.2 with custom package selections, artwork, scripts and any other properties and download them as USB or disk images, Live CDs and a variety of popular virtual formats. 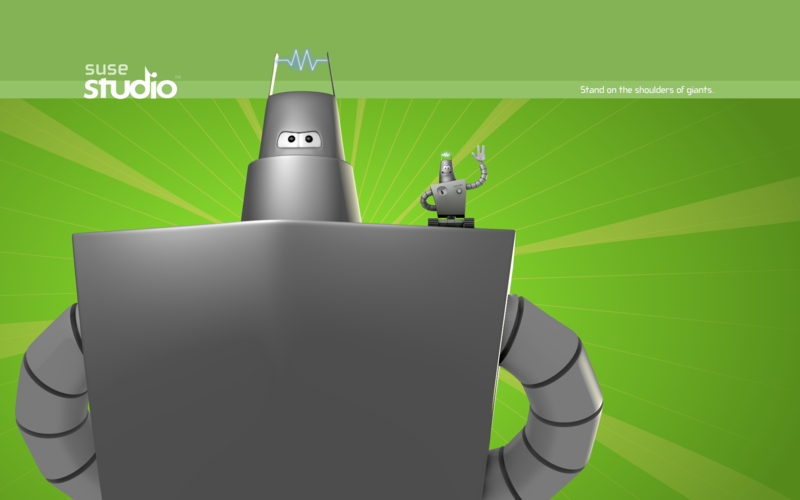 You can share your appliance or also browse other’s shared appliances on SUSE Gallery. openSUSE Tumbleweed users who have a proper setup don't have to do anything special to move to openSUSE. The Packman repositories are of course available for openSUSE 12.2! openSUSE 12.2 includes the SUSEpaste script - the essential collaborative debugging utility to paste outputs/logs easily to the openSUSE Paste site from the command line. The openSUSE build service command line client OSC now supports creating and releasing maintenance updates for openSUSE. In 12.2, openSUSE brings you two modern input method frameworks. One of them is fcitx, an input method framework with extension support. It is the default input method for locales ko, zh_CN and zh_SG. gcin is a stable input method that is famous in Taiwan and new in openSUSE 12.2. It is the default input method for locales zh_TW, zh_HK and zh_MO. A selection of twelve open source font families from Google's web font collection is included in openSUSE 12.2. While including both formats, .otf and .ttf you are free to use them in any word processing or graphics application you want. To learn more about Google web fonts and find more that 500 additional great fonts have a look at the Google web font directory. The openSUSE Reference documentation has been updated where required, with new chapters on GRUB2 and systemd, and updates covering recent changes in KDE and GNOME. 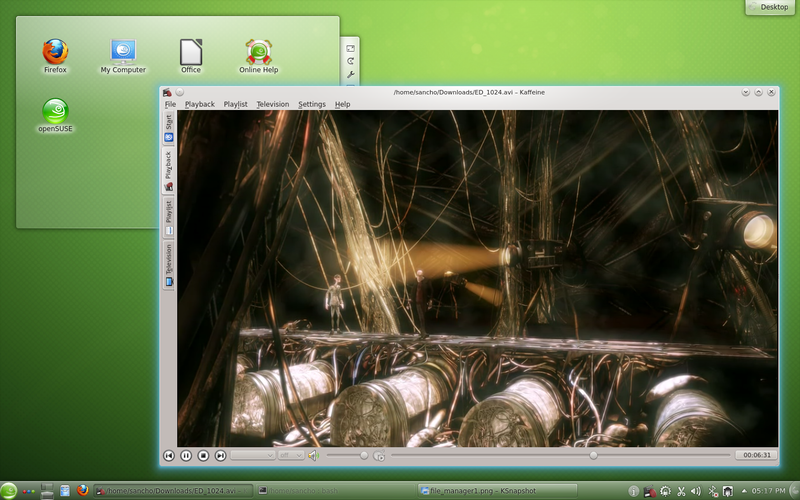 To make space on the DVD images, large books and manuals have been removed, but are part of the openSUSE 12.2 online repositories and are available to read online. The above selection of changes and improvements in openSUSE 12.2 is still far from complete but gives a taste of what is new. We hope you enjoyed reading it! This page was last modified on 25 October 2013, at 08:39. This page has been accessed 126,021 times.